What I love about food blogging is I am able to selflessly share a personal part of me with the rest of the world. I may not be the great Ms. Oprah Winfrey (incidentally, she had her final episode yesterday) in terms of giving, but in some way or form I am able to welcome you to my kitchen and share my time, knowledge, talent and love with all of you. Cooking is personal for me. I don’t cook just to eat. I cook to satisfy an inner desire to be creative, to give, and to satisfy others. Granted I am not a chef that creates artful dishes, but for me, sharing a simple meal with somebody, is a very warm, welcoming and hospitable gesture. When I cook, I am sharing with you something I created with my bare hands, with ingredients that are usually from scratch. I am giving you a meal for that moment, that you and I can share, and I am satisfying your physical hunger for that brief moment in time. Along with a good meal comes great conversation, anywhere from gossip (I admit), to news, to family, to dreams, and anything else under the sun. It is sometimes over a meal where ideas abound (where else could this idea to start a blog have come from, but from one of my shared meals with Veggie Girl). Likewise, when you offer me a meal, whether physically or over the internet, I always try to look at the effort, and the love that went into the preparation of that meal. Having a shared meal is a sacred bond for me. I humbly accept what you offer me, and I thank you for it. Wow, I just realized, shouldn’t I put this entire paragraph in our “About” page? So, for today’s post, I thought of a simple classic comfort food that I think will appeal to both our local and international readers. I figured, most people love chocolate, and who can resist the aroma of warm chocolate brownies baking in the oven? 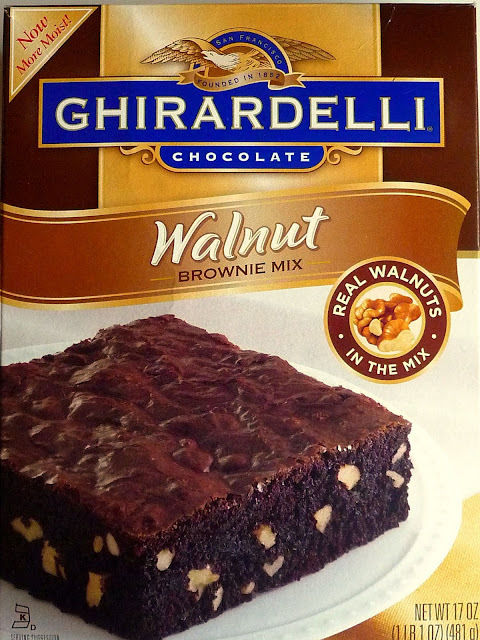 I chose Ghirardelli’s Walnut Brownie Mix because it is available everywhere and it is so simple to prepare. Just add water, oil and egg, that’s it. 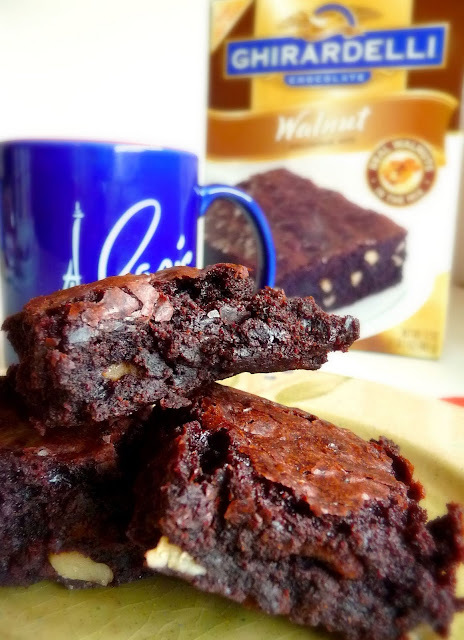 This is my favorite boxed Brownie Mix because of the rich chocolate taste. It tastes just like it's made from scratch, and I like to have it with either coffee or warm milk. For just about $3, it’s sinfully good and it warms the heart. Here's to more shared meals, and thank you all for stopping by.